Business Eye’s annual Profit 200 Companies Survey, sponsored by Danske Bank, will be published in the August edition of Northern Ireland’s leading business magazine. Widely regarded as the trailblazer amongst the various business league tables available in the media marketplace, the Business Eye Profit 200 has always ranked companies on the all important measure of profit. Others have since followed our lead on that front. The Business Eye Profit 200 is highly rated and regularly used as a key measure of the local economy. The financial data for the annual survey is currently in preparation, and we work hard year on year to ensure that the figures included are as up to date and as relevant as possible. In addition to the key measure of pre-tax profit, the annual survey which runs over an entire section within Business Eye also includes turnover, the previous year’s reported figures, and employment statistics. 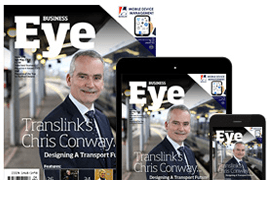 Backed up by comment from key business leaders and analysts, the Business Eye Profit 200 special edition is one of the biggest and best magazines produced by the Business Eye team in the calendar year. Thanks to the Profit 200 figures, this special edition also has a substantially extended shelf life and is often held as a reference guide by readers and their organisations. We firmly believe that this edition offers one of the best advertising and promotional opportunities of the year to reach a dedicated, high level audience of business leaders and decision makers. Business Eye has a readership of 40,000 and is one of the leading advertising platforms in print media. Want to know more about how we can help you promote your business? Give us a call on (028) 9047 4490. Download our Media Pack by clicking here. In addition to 6000 monthly printed copies which are distributed to our trusted database of business readers, we also send 19,500 digital copies of the full magazine to our email database of business contacts – this extended reach is in parallel with the success of Business Eye Online, our weekly email blog which offers concise news and views on the Northern Ireland business and political arena and has attracted a remarkably high open rate amongst its weekly recipients. All of this, combined with Business Eye’s strong and established reputation in the local marketplace, adds up to a unique proposition and a unique platform for our customers to reach out to a dedicated business audience.